Disana Boiled Wool Blanket (big) 140 cm x 200 cm which is 55 x 80 inches. Lovely GOTS certified merino wool. Made in Germany. Stock Status: Out of stock. 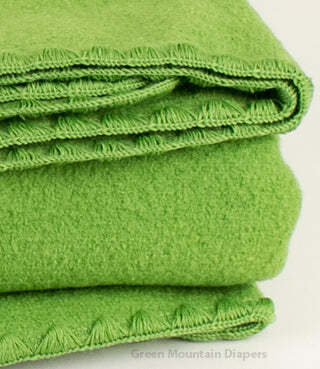 Lovely soft organic boiled merino wool blanket made in Germany. 140x200 cm which is 55 x 80 inches. GOTS certified (Global Organic Textile Standard) organic. We call this "big" to clarify between this and the smaller boiled wool blanket. This is the bigger version. Compare this at 55x80 inches to the surface size of a full size mattress which is 54x75 inches or a queen size mattress which is 60x80 inches to give you an idea of what the size numbers mean. It is a nice size for one adult to use. It works well on a couch. Of course these are lovely blankets to enjoy, but they also can be used as a mattress pad underneath baby, either over the sheet or under the sheet depending on how you want to set it up. Use this instead of a wool mattress pad. This protects your mattress during the co-sleeping time from various sources of wetness. 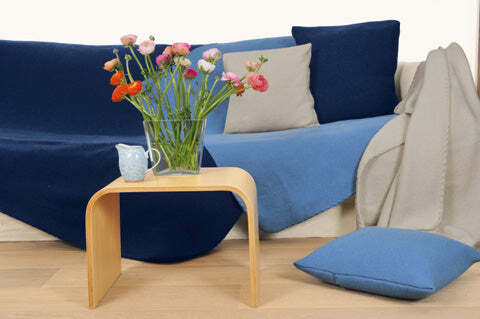 Then, when you not longer need it for mattress moisture protection, you have the most lovely wool blanket to use. A true wool moisture pad is tighter and more dense so it will perform a better under extreme wetness conditions, but the softer hand of the blanket makes it work as a blanket later on, whereas the moisture pad really only is a moisture pad. That's just an alternative use idea to consider. It is also great as a base under baby and blanket for diaper-free times. Of course, you might just keep it for yourself because mom needs some pampering, too. Handwash only. Made in Germany. Below are two Green Mountain Diapers' own pictures of what the colors of the beautiful boiled wool really looks like. I wish you could feel it from where you are. Disana no longer makes this version with the beautiful knit edges. They are now made with simple serged edges. This knit finished edge is really lovely. We can't get them like this anymore.